Forget Churchill Downs – Field Station: Dinosaurs is the place to be this Derby Day! Our Expedition Commander, Guy Gsell, will host a hilarious day of dinosaur racing where kids will decorate their favorite sauropods and run for the roses. There will be dinosaur challenges and activities at every furlong and a finish line celebration with prizes for all our junior jurassic jockeys. Derby residents, show your ID and save $10% off our regular ticket price. Coming in 2019 – The Kansas Climb! America’s Only Challenge Course in a Dome! Four stories of aerial adventure, camaraderie and fun. Get early access on Saturdays & Sundays from March 23rd through April 14th from 11am – 1 pm and 2pm – 5pm. 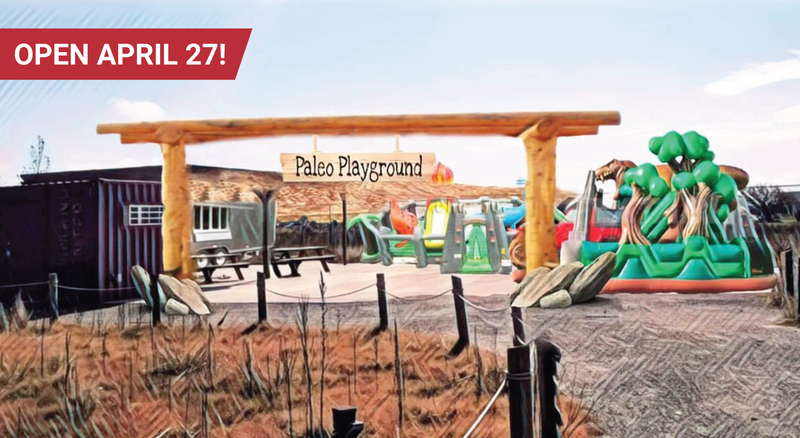 The Paleo Playground is the perfect place for young scientists to let off steam and literally bounce off the walls! Our obstacle course will bring out the Indiana Jones in every kid and the super, Dino slide will take our adventurers on the ride of their lives. It’s the perfect place for families to hang-out, explore and have a blast! Explore the 14-acre park, featuring over 40 moving and roaring life-size animatronic dinosaurs! 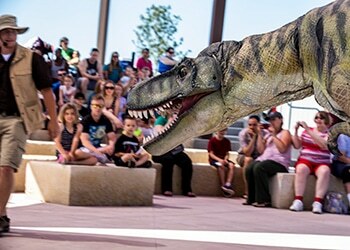 Discover the story and science of Dinosaurs with over 30 live shows, games and activities every day. Laugh with our fearless dinosaur wranglers and come face to face with The Mighty T-Rex. Journey around the world and score a hole-in-one at Jurassic Golf. Sing-along with the Dinosaur Troubadour and paleontology’s biggest hits. 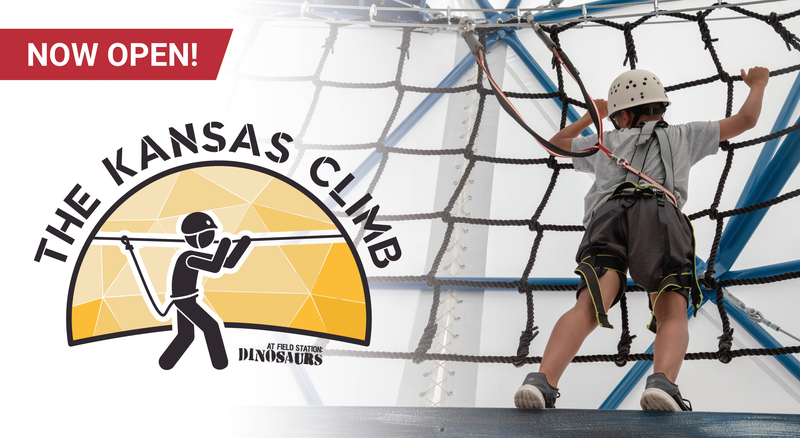 Climb to new heights on North America’s first challenge dome and take in a bird’s eye view of the Dinosaurs. Bring your group into a Paleozoic world of mystery, learning and unforgettable thrills! North America’s only challenge concept that combines a ropes course with a geodesic dome! Journey through waterfalls & rock structures on your way to 18 challenging holes of fun! Get The Latest News, Invites & Offers By Email or Texted To Your Phone! A world-class family attraction that combines cutting-edge science with the creative minds of great artists to create a one-of-a-kind experience that’s thrilling, educational and fun. The Field Station is a wild scientific expedition just 10 minutes south of Wichita on Rock Road in Derby. Over 40 life-sized, moving, realistic dinosaurs come to life thanks to the brilliant engineering of the world’s leading roboticists and the imagination of our artists. And at the center of it all is the fun, the joy and the wonder of dinosaurs. Our expedition takes every family on a shared adventure – full of mystery, surprise and a sense of awe. Walk along our trail, check out our dinosaurs and participate in over 30 live shows, games and activities, which are all included in the Day Pass admission price. Visit FamilyDaysOut.com for fun things to do near you and all over the USA. Family Memberships on Sale Now!